People as Prey: A Visit to the Field Museum – Christina M. Colvin, Ph.D. I am a little obsessed with taxidermy. So, during my recent visit to Chicago for the annual MLA convention, I had to make a trip over to the Field Museum of Natural History to check out their large and diverse collection of stuffed animals. Because of my enthusiasm for taxidermy, I knew that Carl Akeley, the “father of modern taxidermy,” worked as the Field’s Chief Taxidermist from 1896 to 1909. I was particularly looking forward to seeing the examples of Akeley’s work that the Field continues to display, including the famous “Fighting Bulls” group, a pair of elephants Akeley himself shot and killed (or, if you prefer the sanitized term, “collected”) during one of his many expeditions to Africa for such purposes. Beyond Akeley’s work, the famous taxidermied animals I most looked forward to visiting at the Field were the Tsavo Maneaters. These two male lions terrorized construction workers building the Kenya-Uganda Railway for ten months back in 1898. During that time, the lions earned their name by killing and eating between 20 and 135 people (depending on who you read/believe). After a couple decades spent as trophy rugs in the home of the man who successfully hunted them, the Field Museum purchased, mounted, and displayed the lions’ hides under glass where they remain today. Despite their age (and the fact that the Field exhibits many exquisitely taxidermied animals that emphasize the lions’ worn, scrawny appearance by comparison), the Maneaters continue to get a lot of attention. I watched other museumgoers Instagramming each other in front of the lions’ display while most of the other animals received passing glances from visitors at best. 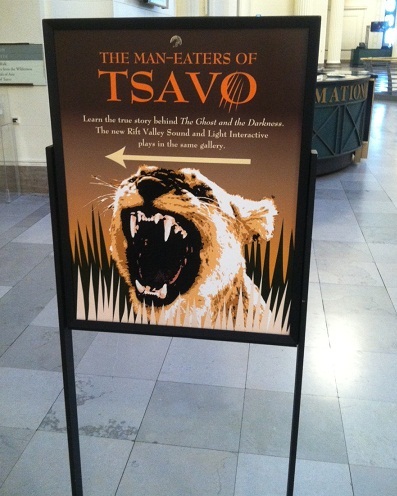 The museum also builds visitor expectations about the lions through the use of promotional signage: these signs, pointing visitors to the Tsavo Maneaters, depict lions that look much more fearsome than the old, stuffed cats themselves. The taxidermied Maneaters do not roar or show their teeth as do the lions on the signs; instead, they lie down and walk casually. Like all male lions in the Tsavo region, too, the Maneaters are without the full, bushy, distinctive manes usually associated with male lions, a conspicuous absence that contributes to their rather unassuming appearance. The discrepancy between the lions on the museum’s signs and the lions on display got me thinking about what makes these animals so compelling as taxidermy mounts. To an extent, the popularity of the Tsavo lions has to do with what makes taxidermy itself so compelling. All taxidermy records some kind of human-animal encounter: a sportsman’s “accomplishment,” the early death of a popular zoo animal, a beloved pet with a bereaved owner. 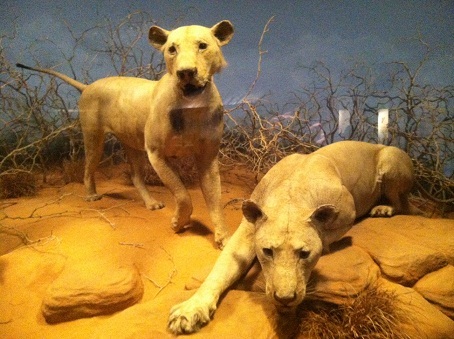 The human-animal encounter recorded by the Tsavo Maneaters, however, is uniquely written into the very chemical composition of the lion skins on display. Recent tests of samples of the Tsavo Maneaters’ hair confirm that the pair consumed human flesh during the months before their deaths. Unlike most taxidermy which one-sidedly reflects violence inflicted by humans, the skins of these lions–the very basis for taxidermy (dermy meaning skin)–attest to a history of violence wherein both humans and lions inflicted harm on each other. In a recent article, June Dwyer argues that the human desire for wild animal companionship in the twenty-first century is so strong that we prefer to re-imagine meat-eating animals as vegetarians to fulfill the wish to “eat with them, not be eaten by them.” While I agree with some of Dwyer’s article, the enduring popularity of the Tsavo Maneaters, not to mention the several taxidermy displays at the Field that depict predation, suggest in contrast that the possibility of our becoming a predator’s lunch provides an opportunity to rethink our relationships with animals without diminishing the challenges involved with coexistence. Rather than obscure their man-eating, I think we paradoxically celebrate these lions because they dined on human flesh, because our bodies nourished theirs. I think we appreciate that we can’t re-imagine them as harmless or non-threatening. Even though their hides are worn and their mouths don’t arc into a growl, the Tsavo Maneaters remind us not only of our exposure to the acts of animals, but also that we are not the only animal who acts and who eats. Tina, This is fascinating. As someone who is supremely creeped out by taxidermy in concept and in practice, it is interesting to read your experience, filtered through such a different lens. I think you’re right that the maneaters are popular because of their violence, but I wonder if part of the attraction for modern audiences isn’t the very fact that they are decomposing, they are contained, they are dead. Danger that once was, but is no longer–like the experience of “becoming” a miner at the Munich Deutches Museum (http://montrealmadame.com/2013/10/12/deutsches-museum-in-munich-less-than-the-sum-of-its-parts/). As part of a museum, are they portrayed as a fixed part of the past (lions surely do not eat humans any more…just like there’s no such thing as cramped, dark, dirty mines?) rather than revered as equal partners on the top of the food chain. Thank you for your interest and your feedback, Maureen! I think you make an important point: the structure of the museum certainly does position the lions as something dead and of the past, making our observation of them a comfortable, non-threatening activity. Part of what interests me about taxidermy, though, is that it preserves dead things as if they were alive, and in fact does everything it can as an art form/research tool to prevent decay. Taxidermy tries to stop decomposition and facilitate memory. So, yes, the lions are old, and they show it. But thanks to the taxidermic arts and the efforts of the museum, the lions endure, and there are still traces of human flesh detectable in the composition of the lions’ hair. The line between dead and alive gets blurry and uncomfortable: this very specific facet of the lions’ way of being in life persists in what remains of their bodies. So, absolutely I think your reading is right. I just like to hold out a special place for taxidermy and what it uniquely tries to (and, I think, succeeds in) accomplish(ing). Tina, That makes a lot of sense. I see what you’re saying now about the special case of taxidermy itself. It certainly is a unique form, inhabiting the space between dead and alive, art and reality. This is a fascinating idea, one that I must say I had not considered before (as I mentioned above, I’m generally too creeped out by taxidermy to think much about it, but perhaps this is actually WHY–here is this dead thing, masquerading as a live thing. I think I find the process of interrupting decomposition deeply troubling and unnatural when it comes to animals, though–curiously–I do not mind mummified humans.). I love reading and thinking about your writing, Tina. Keep it coming!